There are times I just really want to share things with you when I happen onto funny or inspiring Instagram posts...or yummy looking recipes on Pinterest...or a super cute pair of shoes I found online. You know, the fun stuff you text your best friend about. So I do a post from time to time called Friday Five...which is five things I've come across that week that I loved or wanted to share! Here are this week's Five! I'm in the middle of reading this book and it is so stinkin' cute!! If you need a sweet read, this is totally for you! Charlotte Malone, the owner of a successful bridal shop in Birmingham, Alabama, believes the "right" dress finds its bride, not the other way around. But Charlotte can't find a dress for her own upcoming wedding. 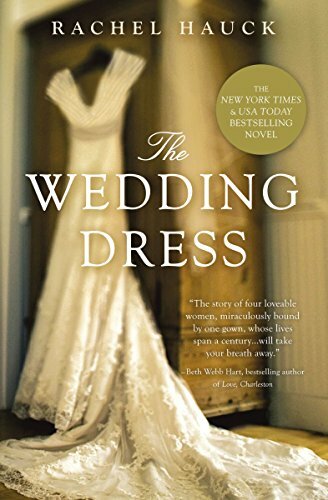 When she discovers a beautiful hundred-year-old wedding gown in a battered trunk with a welded lock, she’s compelled to uncover the mystery of the dress and the three women who wore it. Eleni Pappageorge's light, airy voice fits this lovely story of faith, mystery, and magic. Her Southern accents are convincing, and one can hear a smile in her tone. Although her portrayals of the story’s elderly female characters are sometimes a bit “gushy,” they simply add to the charm. Want to see my pinboard for it?! I can't wait to start painting! I just sent the final FINAL draft of my book in to my editor in yesterday!! It's currently at the printer! Ahhhhhhhh!!!! And shhhhh...Presales have officially opened on Amazon. But we're not really announcing that yet because we're going to do a bunch of fun gifts for those that DO preorder and we haven't announced those yet. Stay tuned! Some super sweet friends gave me a gift last night during the planning meeting for our Women's Conference and I'm just over-the-moon about it. They had gone in on it together to remind me that even though Abreham is no longer living with us, he's still ours...and we're still his. That family is forever. Isn't it amazing and thoughtful? And doesn't it SERIOUSLY look like all of us?! Even the outfits and hair are either things each of us wears in real-life or we would wear! Want your own? (of course you do) Click here for Nicolle's shop! Speaking of sweet and sentimental, I'd happened on to some tear-jerker videos this week while looking for inspiration on a project I'm working on. Take a look at some of these (sob). Moms...grab a box of kleenex for this next one. The kids are off from school today so we're headed to our favorite Ethiopian place for lunch...gotta go! If you're ever in Denver and decide to try it, totally get the Doro Wat. You can thank me later. Enjoy your Friday and the beauty of the weekend! Summer is such a perfect time to gather, don't you think? Whether it's spreading out an old sheet for a picnic in the park, dinner under twinkly lights on your patio, a casual BBQ with all the fixings, or an outdoor movie in your backyard...these warm months make everyone want to live a little slower and enjoy moments more fully. In honor of opening our door and inviting people in, I thought a giveaway full of fun hosting essentials would be a fantastic way to welcome summer. Who says paper plates need to be boring? These pretty floral plates will liven up your outdoor tablescape (even if you have a black thumb in the garden, like I do)! Wondering what this cute little swan is? Leave it to Anthropologie to come up with the cutest bottle opener ever (PS I have it, too! With a maiden name like Swanstrom, I'm kind of a fan of swans). Ahhhhh linen. I may not wear linen clothes often because hello, wrinkles! But there's something just so elegantly casual about using this beautiful fabric on the table (especially when it comes from Williams Sonoma). And this light mint color is neutral enough that it can be used all throughout the year! Truth be told, I nearly kept this little salt grater. How cute would she be on the table (yes, it's a she)? I found it at Williams Sonoma the day I bought the tablecloth, but realized later you can find it for less on Amazon (yay Prime)! What meal is complete without pretty napkins? I'm including not only cocktail napkins for drinks and appetizers but floral cloth napkins as well! Are you in absolute LOVE with these metal rose gold napkin rings?! I sure am. If ever there was a season for salad-eating, Summer would be it. These wooden salad tongs are a favorite in our kitchen! I know, I know...I had you at Kate Spade. These charms will definitely help you remember which drink is yours! Are you a fan of place cards? I sure am. 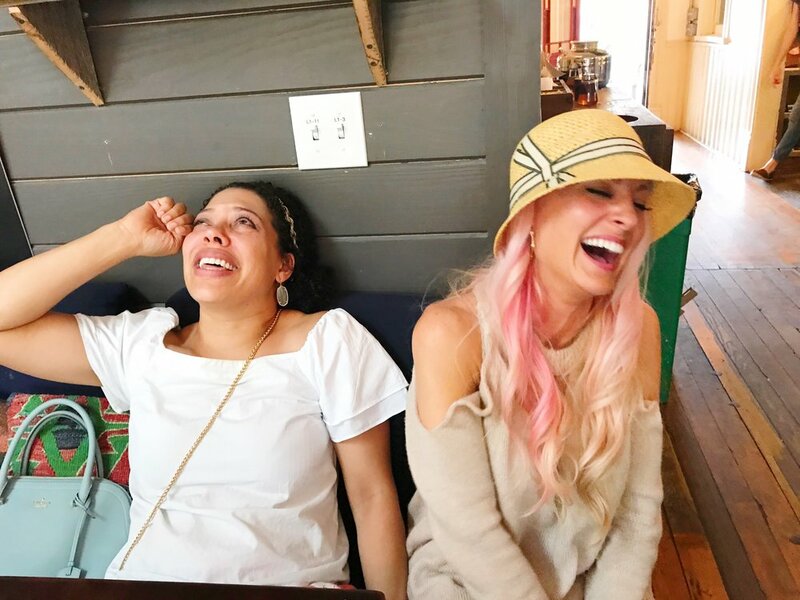 I love helping my guests get outside their comfort zone, sitting them next to people they don't know well (but folks I know they would love!). My favorite part is seeing guests sit down uncomfortably at the beginning of dinner and exchange phone numbers and hugs with their new bestie by the end of the night! I just had to include this little bag of coffee by Two Rivers Coffee because, well...doesn't an iced coffee just sound so good right about now? I bet your guests would agree! I use these paper bowls all the time. From ice cream to popcorn to watermelon wedges and frozen berries, they're the perfect way to add color to the table without having to wash a single dish! And the wooden spoons just remind me so much of buying ice cream from the ice cream truck when I was little. So nostalgic. Speaking of paper, if you've ever been to a party at my home, you've probably sipped a cool beverage through a cheerfully colored paper straw. I'm more than a little obsessed with them. What do you think? Good stuff? Entertaining essentials you'd LOVE to use at your own little dinner or brunch? Which are you most excited about?? You ready to talk rules?? Make sure you've subscribed via email to www.teresaswanstromanderson.com. You can do so by clicking the prompt in the sidebar. If you're already a subscriber then skip down to number TWO! Take 60 seconds to fill out this survey below. Tell me what you're loving about the site and what you'd love to see more of. GIVEAWAY CLOSES 11:59PM PACIFIC TIME ON THURSDAY, JUNE 15, 2017. The winner will be chosen at random (by looking at Mail Chimp's list of those subscribed to the blog as well as Survey Monkey's response) and will be announced on Instagram and Facebook on Friday, June 16. If the winner does not provide their mailing address by Tuesday, June 20th, an alternate winner will be chosen.